His Beatitude Sviatoslav : "To worship the crucified Christ - means to profess the cult of God’s power "
For the people of the third millennium salvation of their own souls is often associated with the cult of pleasure. It was said by Father, Head of the Ukrainian Greek Catholic Church, His Beatitude Sviatoslav (Shevchuk) today during the homily in the Patriarchal Cathedral of the Resurrection of Christ. Primate recalled: " During the last century, it seemed that a person became more and more powerful: uncovering the mysteries of the universe, reigning over the earth and the heavens. A man considered himself to be omnipotent. And the cult of human power caused two terrible wars in the last century. " " But in the midst of the world, where the cult of human power is put on the thrones of social life, we Christians worship the Holy and Vivifying Cross. We, the Christians do not profess the cult of a man but of God's power - power that can really transform a man himself into a better person. This is the power of God, which manifested itself to our crucified Saviour on the Cross, is the power of love, "- said His Beatitude Sviatoslav. The Head of the Church explains that "to worship the crucified Christ means to profess the cult of the power of God. " "We, the people of the third millennium, often associate the salvation of our own souls with the cult of pleasure - to live for our own pleasure, to be the centre of our own lives. And a person becomes violent, stranger to everything that surrounds him or her. But the worst thing is that pleasing yourself means destroying yourself. But such a person would never be able to please himself, because nothing will be enough, he will always feel dissatisfaction not reaching the goal of his life. That is why Christ tells such a person, who is a slave of his own pleasure and lust: Tell yourself "no," only then you save yourself and all those who are near "- assures the Bishop. 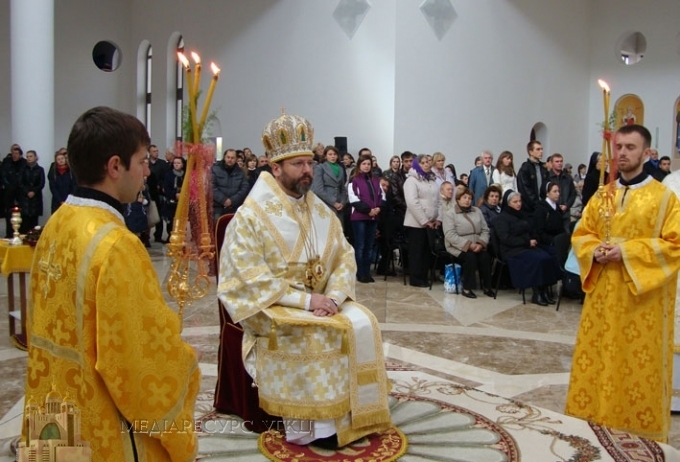 At the end of the Liturgy the Head of the Church presented "canonical mission" to the laity of Kiev archdiocese who have taken training courses of Catechism. So now these laity has the right to teach other people good will of truths of the Christian faith. "We will send them into the world to teach the love of God to our neighbors, children, youth and the elders. The power of the kingdom of heaven means to penetrate the world with the Cross power of God's love by means of sharing your faith "- said His Beatitude Sviatoslav.